Named for the locations in literary classics, these soy candles evoke the book's most memorable moments. 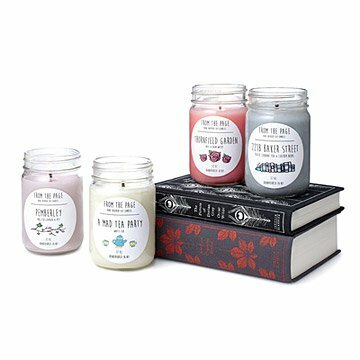 Transport yourself to Alice in Wonderland's madcap tea party, Sherlock Holmes' study, Jane Eyre's ambrosial rose garden, or an ivy-filled escape out of Pride & Prejudice with Callie Meaney's bookish candles. Named for the locations in literary classics, these soy candles evoke the book's most memorable moments as they ignite your imagination. Custom blended fragrances let you get lost in a book by adding an irresistible new layer of intrigue. Choose from four, fantastic fragrances. Hand-poured in Valley Stream, New York. 3.75" H x 2.75" dia. ; 12 oz. Never leave a burning candle unattended. Keep wick trimmed to avoid big flame, don't burn longer than 4 hours at a time to avoid overheating. Keep away from drafts, pets and children. My wife loved this candle themed after Jane Austen's books! This product is great! The design is lovely and so is the smell. My mother loved it and it was totally worth the price. I would buy this again for someone else. My friend Chloe really liked it. It was a bit smaller than I expected and overpriced, but I understand that this was because it was handmade. The candle itself smelled wonderful, and the label printed on it was well done. I was very happy with what I received! It smells really good. I love Sherlock Holmes so I thought it was really cute, too. I love the idea behind this candle, especially for a book lover. I was a little disappointed when the candles arrived and the labels or crooked and bunched up in some areas. Unfortunately, this gave the candles a cheap, homemade kind of look. Great scent, great idea....was just s little dissapointed in the simplicity of the label - a little too "homemade" looking. I opened the candle just out of curiosity (as it is a gift) and I spent the next 5 minutes sitting on my couch smelling it! I loved the Mad Tea Party scent and its inspiration is perfect as my boyfriend has a soft spot for all things Alice in Wonderland. The products came quick and smelled awesome. My daughter will love them!